Buckle up, earplugs in. A deafening roar. A breath away we hoover in a small twin otter above the fog between steep forested mountains. The rising sun blinds our eyes through the small cockpit windows. 2 pilots. 5 passengers of which 2 dreamers for mystical high valleys and roaring peaks. A 50 minute, impressive flight would bring us from the hot and soaking lowlands into the heart of remote, western Nepal. Right into the heart of the world’s highest mountain chain. The Himalayas. Before we realize, we see an airstrip appear through the cockpit’s window. Touch-down Simikot. 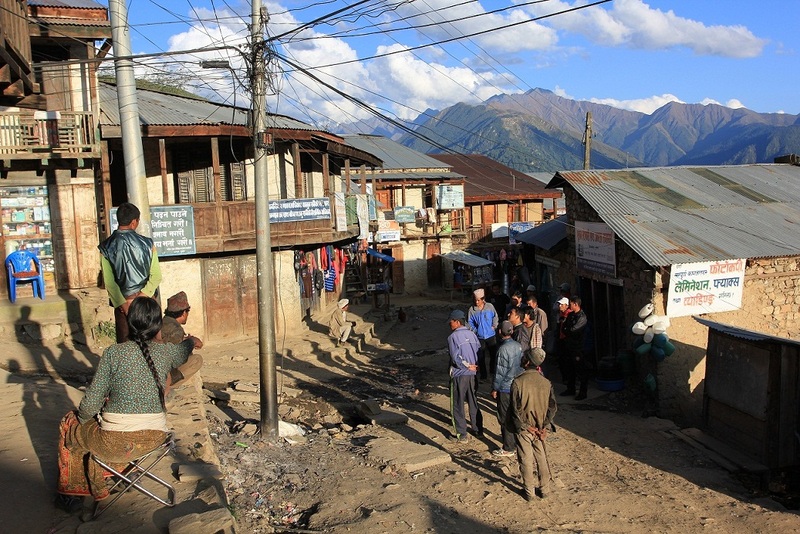 At almost 3000m asml, the capital village of Nepal’ highest, northernmost and most remote district Humla. The sprawling village has no road access. It takes 14 days walking to the closest road head. 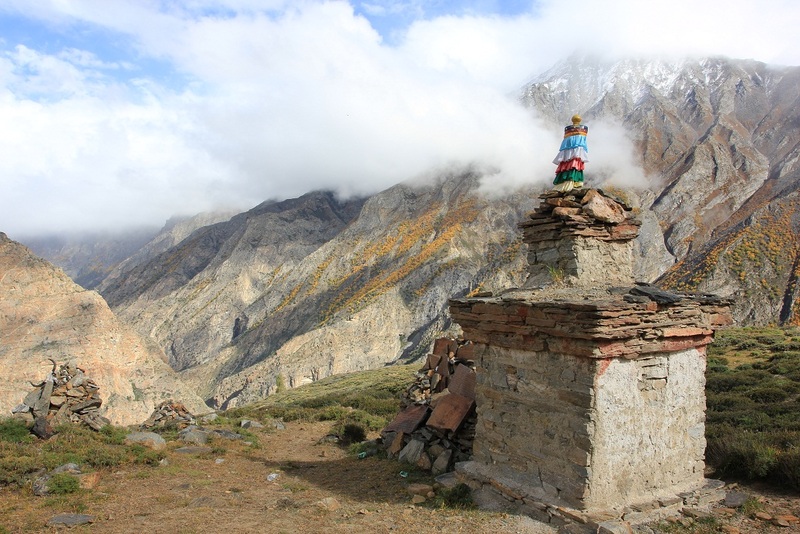 This closed-off corner of the world, deep in the Himalayan mountains is carpeted with centuries-old migration paths in and out Tibet, just a stone throw away. 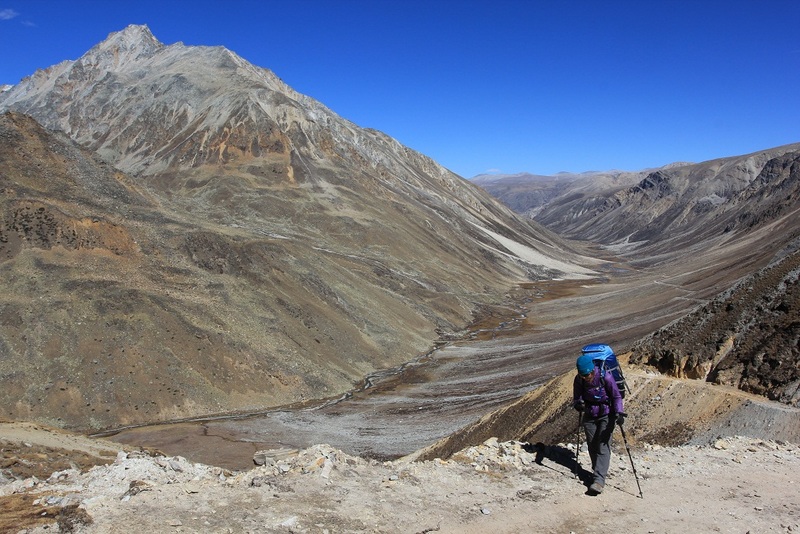 We have the intention to backpack in 3 months a considerable distance of the Great Himalaya Trail, which is in contrast to famous long distance trails in Europe or the States, more a suggestion for a traverse along the world’s highest mountain chain, extending through Pakistan, India, Nepal and Bhutan. 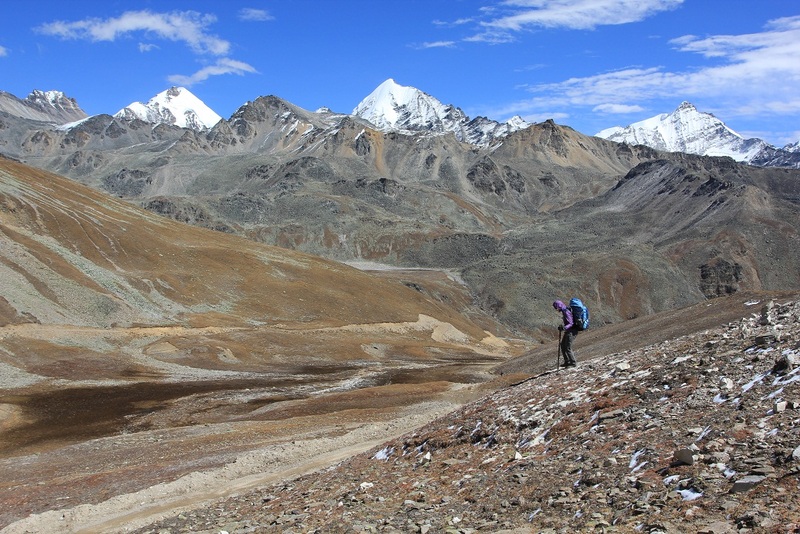 The “trail” is an unmarked nor signposted route of which you pick and mix your way out of the web of paths through and over the roof of the world. 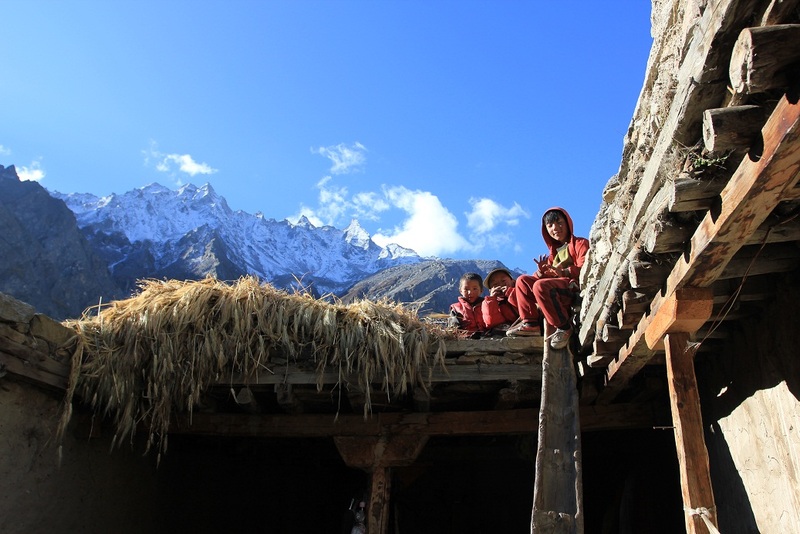 The philosophy behind the trail is to attract trekkers to more remote parts of the Himalaya, where tea house trekking is till a far away known. Its goal is to attract visitors to under-developed and impoverished areas where only few alternative development opportunities exist. We have chosen to explore the more forgotten and hidden valleys, passes and peaks, with the intention to support the local people as much as possible. 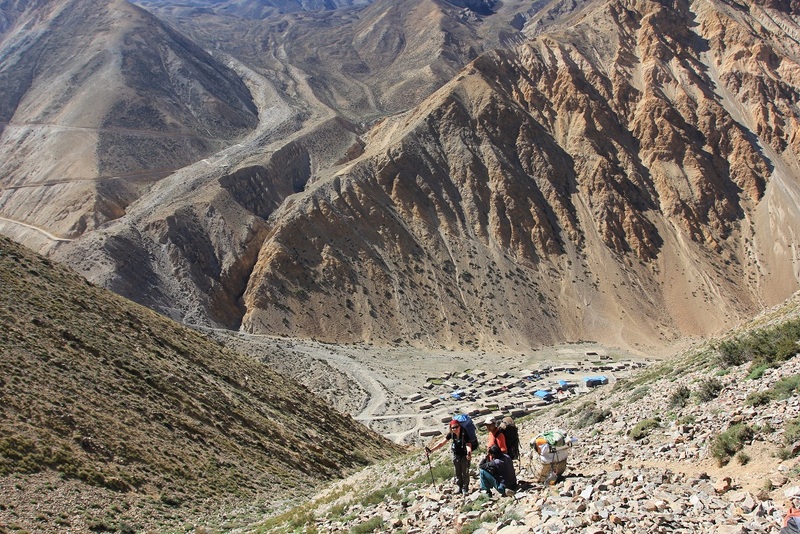 We did not bring a an expedition crew of porters, carrying kitchen tents and food from far away to cook on campsites in between the villages. 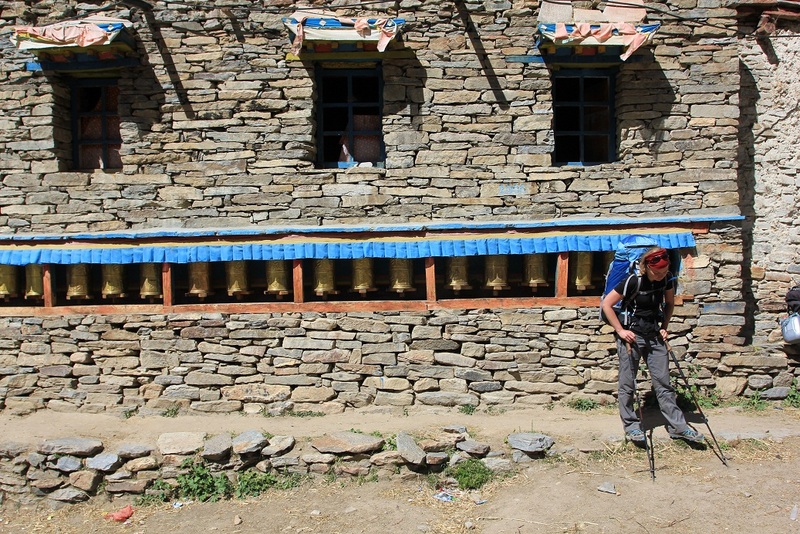 In stead we come lightweight, in-Himalayan style, carrying our own gear. 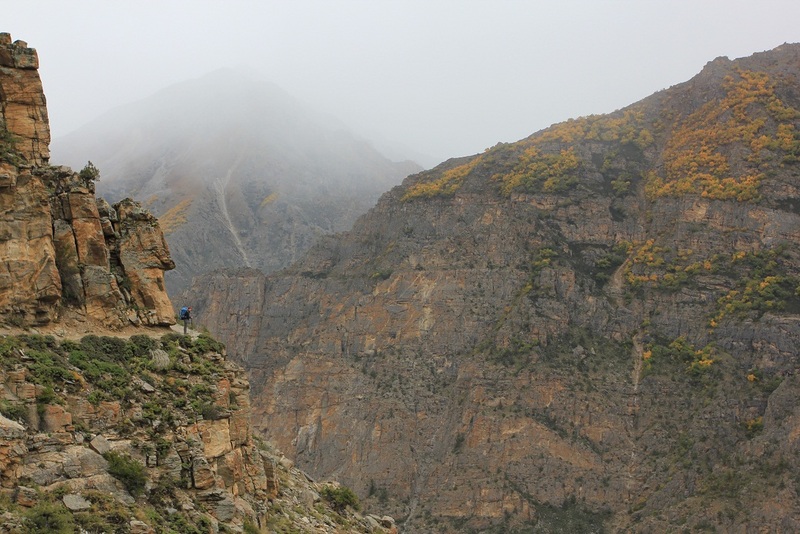 Ram, our guide, leads us through the web of ancient old, bad mapped caravan routes and to handle language barriers with all the different ethnic groups of which cultural differences vary from one valley into another. 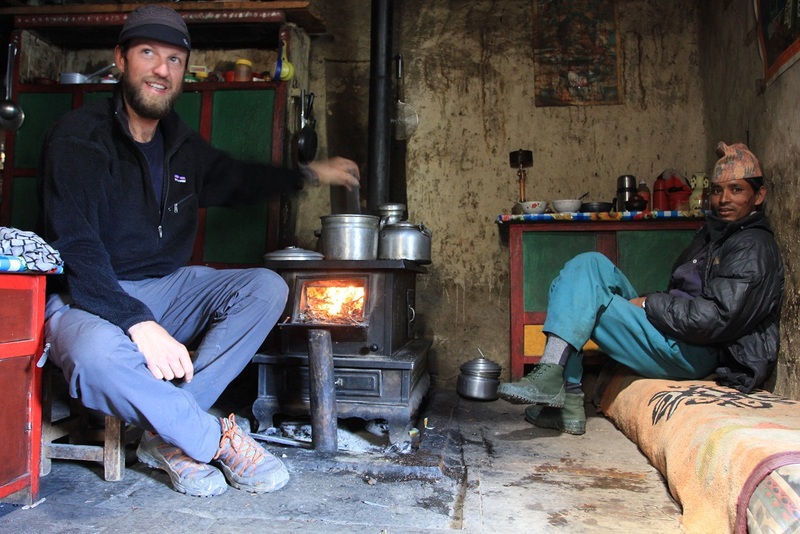 In the spirit of the the Great Himalaya Trail, we will stay as much as possible with the people, share their table and sleep in their room or on their roof. In the far western part there is nothing yet resembling a tea house or anything worth naming a tourist facility. More then once we are invited to stay with families who never had a stranger over the floor. Sometimes distance between the villages would be more then a day walk away so we hire a local porter for carrying some camping food into thin air and wind swept passes. 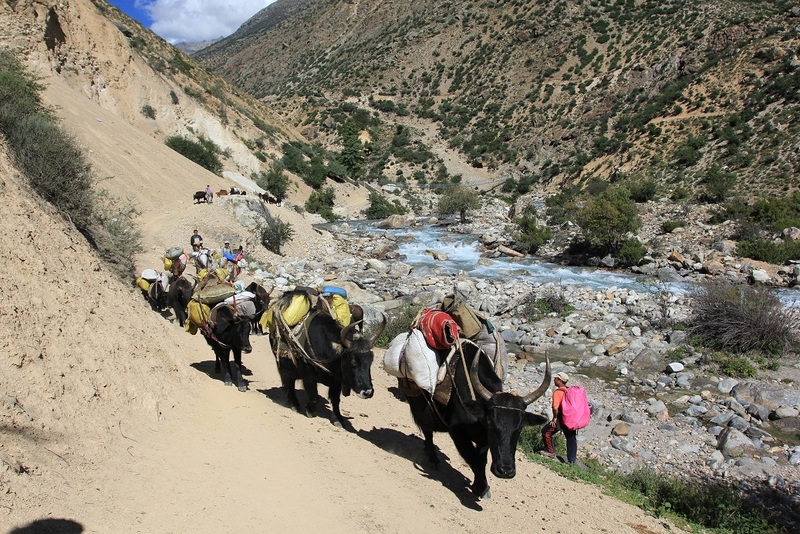 We follow yak and mule caravans towards the Tibetan border through the fertile Humla Karnali valley, along medieval stone-build villages. 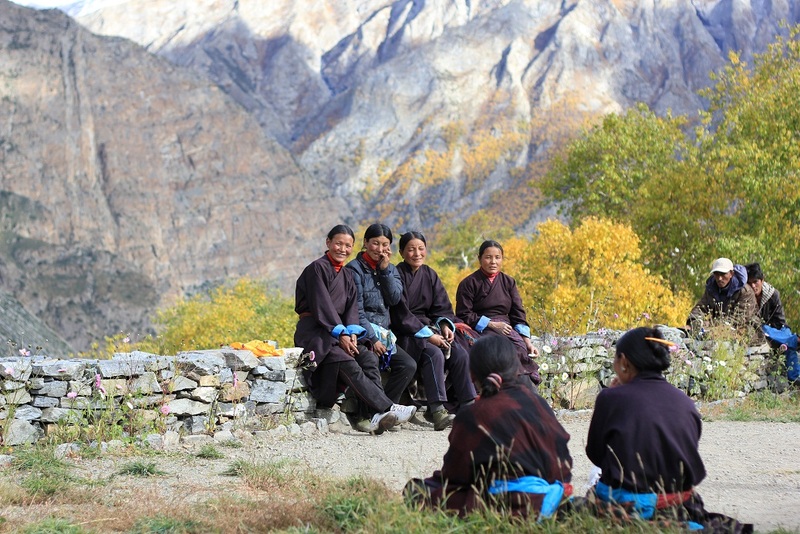 The sound of the wind is broken by women chanting ancient Tibetan songs while harvesting the barley fields. We’d greet “Namaste” to young men wearing the “HortN” Face (no kidding!) jackets and send off “pen” and “chocolate” begging children to school. The sun burns our pale skin while air is getting thinner. 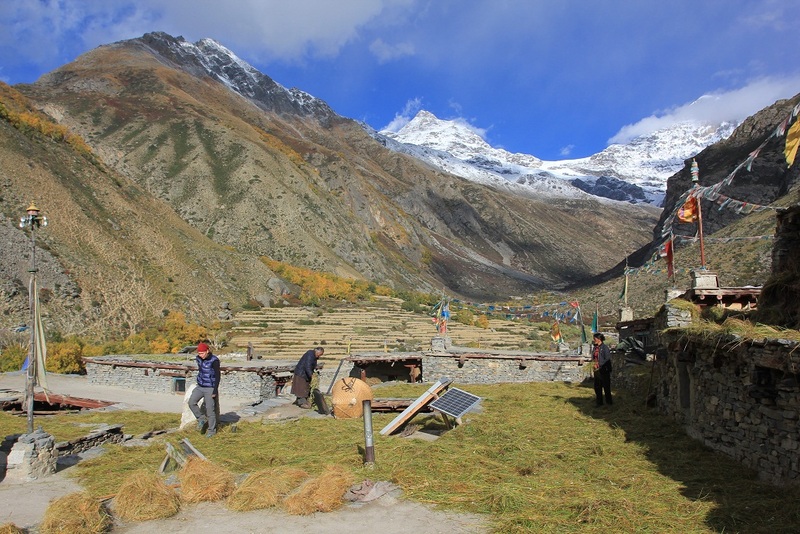 In Hilsa, at the border with Tibet, Nepali’s most northwestern border point with Tibet and Nepali’s Great Himalayan Trail western entry point, we swing up even more north into the Limi Valley, only open to foreigners since 2002. A steep trail is cut high up into an impossible looking valley wall, high above the roaring Karnali river. Rooftop terrace. Til village. Limi Valley. These steep mountains didn’t stop human looking for living grounds but surely it kept industrial revolution get through. People live on the rythm of day and night, living to live and survive on their own. Development stopped here a couple of centuries ago. Til, Halji and Jang represent villages out of medieval times. 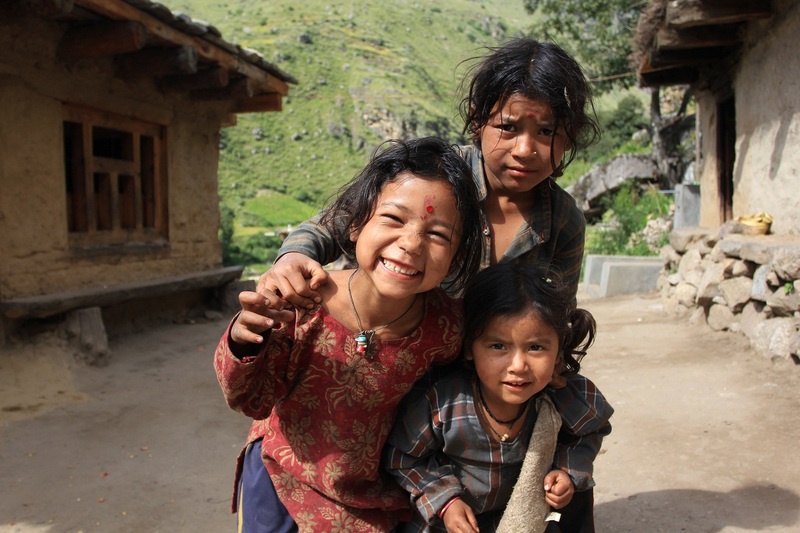 Kids would flock around us and touching us endlessly as we were new toys when we enter the villages. 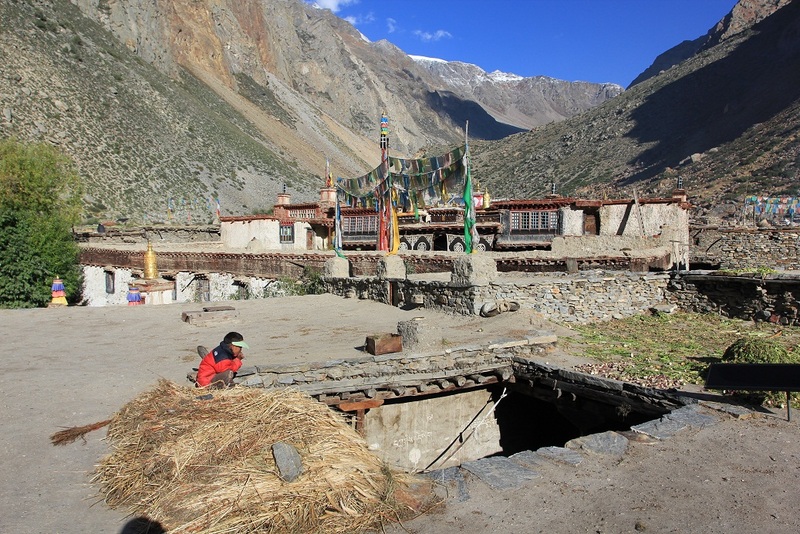 In Til and Halji we sleep in the house of the Lama and visit their 5 centuries old, impressive monasteries. 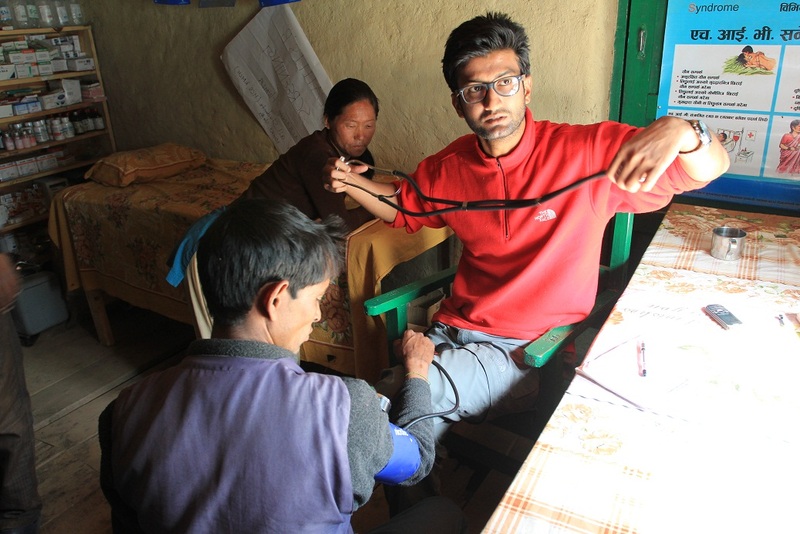 We encourage the work of some NGO’s, building primary schools, health offices and micro-hydro and solar power into these villages. But in our short time here we discover pathetic flaws into some of their work. Building a health post stocked with pills and to post the place with a flew-in doctor a couple of weeks a year will make things better right? Children of Halji. Limi Valley. Impressive 500-year old Gompa. Halji village. Limi valley. Building a primary school with foreign money. Check. An educated teacher. Check. School furniture. books and utensils. Not so always check. The “sponsor” is doing his yearly tour along the villages. A nice good-looking American, handing out useful and not so useful gifts. Continuing to the next village. Nice? Euhm. But why not checking if the kids really have learn something? Waving goodbye. 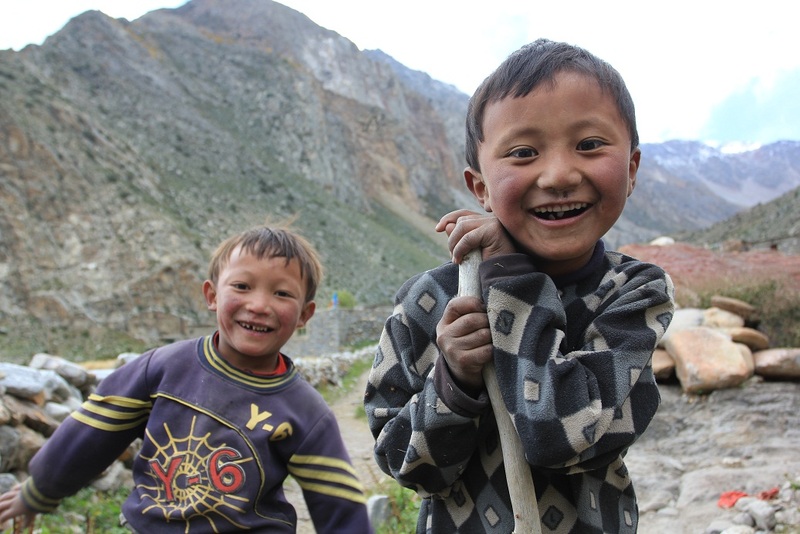 Children of the head lama of Halji village. Limi Valley. Solar panels and micro-hydro power. A couple of years later. Half of it in decay. Continuation? And that while famous NGO-representatives sipping expensive bears and chicken wings far away in their nicely built office in Simikot. Prayer Rolls at the entrance of Yang village monastery. Limi valley. Incredible Milky Way. 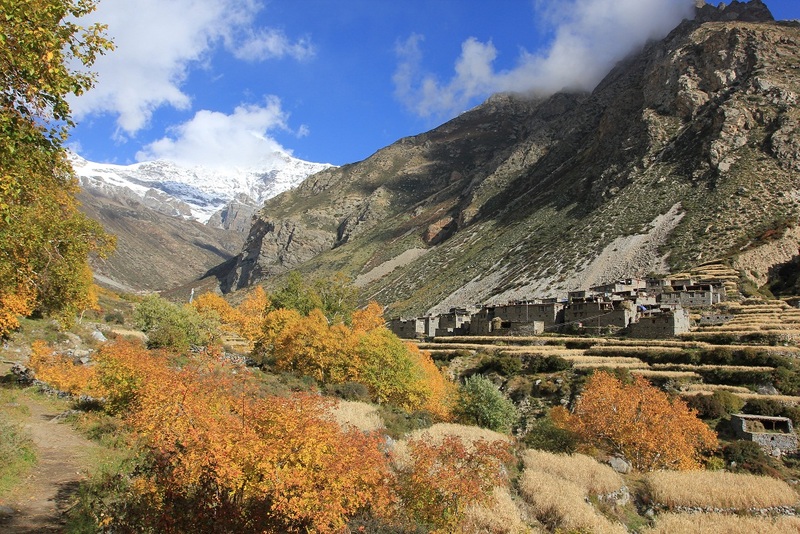 Bivaouc at the foot of Nyula La pass (5000m). River crossings. Still awesome. Especially at 4500m asml. It all starts with educating the people, young and old. 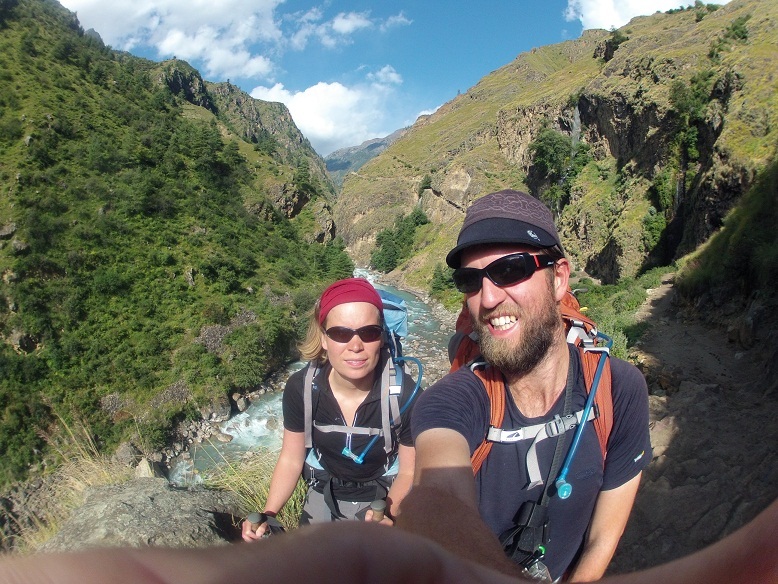 Climbing up to Nyula La (5000m). Tibetean plateau in the background. Coming down from Nyula La (5000m). Unscaled, unnamed virgin 6000m peaks in the background. 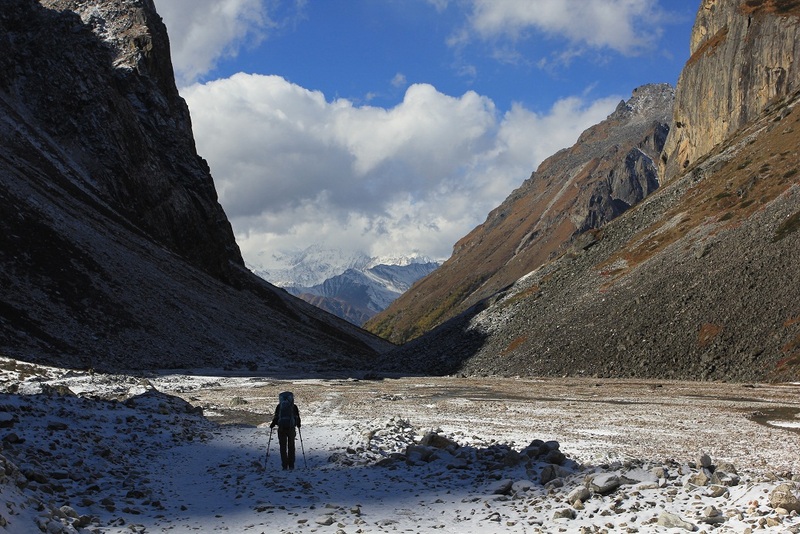 Heading down back to Humla Karnali Valley. We’re only 14 days off in the Nepali Himalaya. It already carved a deep impression. It’ a pilgrimage through the highest mountains and deepest valleys of the soul. We’re heading east now. 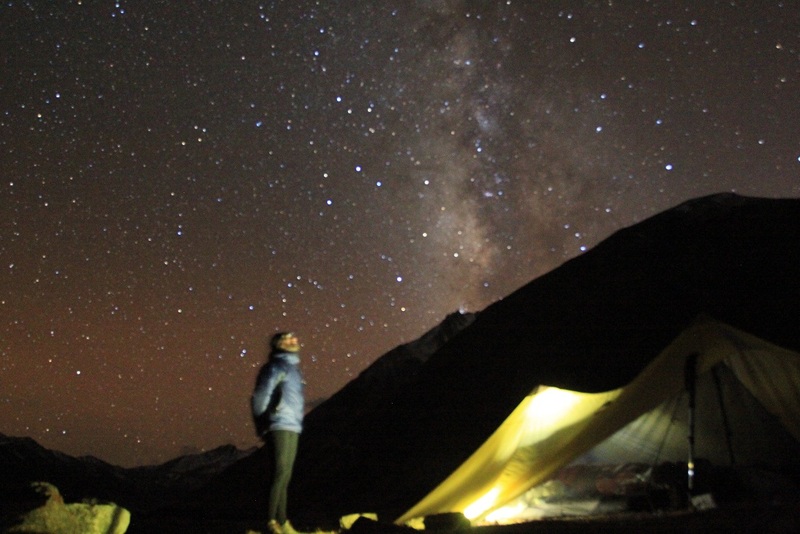 Into Mugu and Jumla and through Dolpo. Dreamers on thin air. 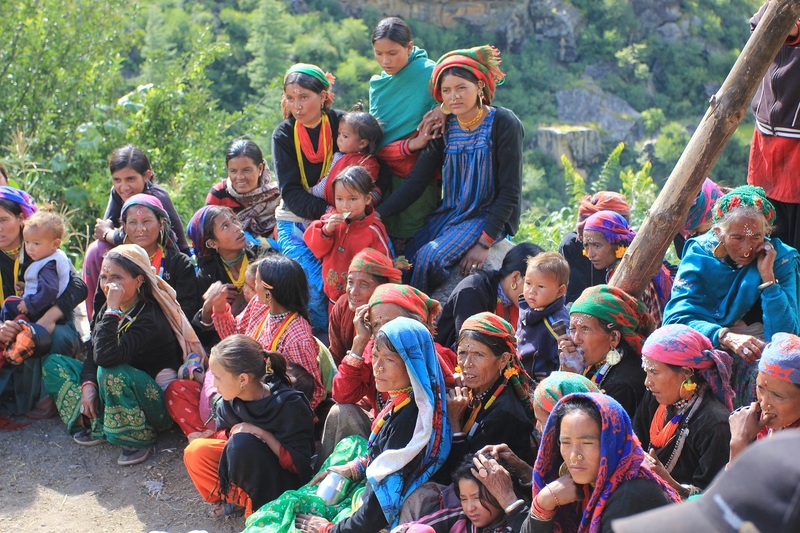 Humla Karnali. Nepal. 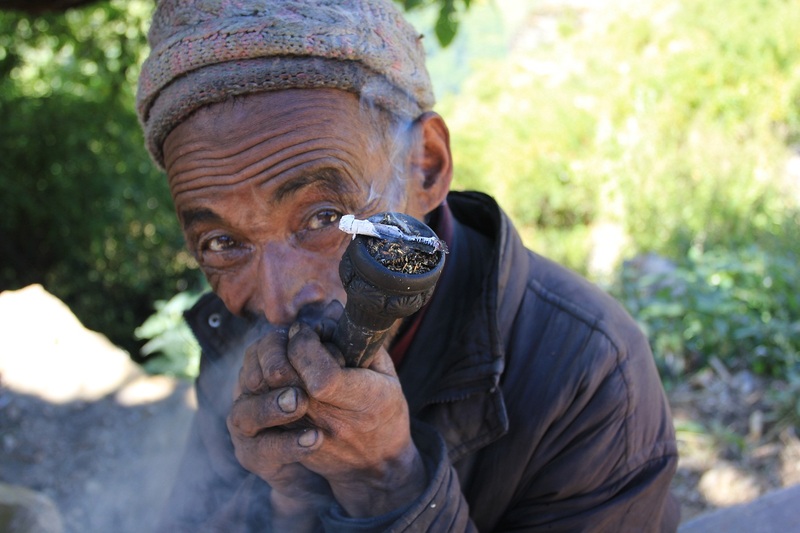 This entry was posted in Backpacking, Gap Year, Hiking, Trip report and tagged Great Himalaya Trail, Himalaya, Humla, Limi Valley, Nepal, Tibet. Bookmark the permalink.